Periscope has taken the social media world by storm since its debut in April 2015. However, the use of Periscope may also be creating a storm. Its popularity has grown extremely quickly, but many are still trying to figure out how to use it, if their audiences are on it, and how to capitalize on using Periscope for business. As with any tool or ability that develops rapidly, at some point there needs to be a discussion of proper etiquette for using it. I have searched and searched online, and so far there doesn't seem to be very much advice offered, but I've been collecting some thoughts and opinions both of my own and from others that will form the basis for this guide. Para leer esto in Espanol, ir aqui. Scopes normally happen either impetuously (without planning) or on a regular schedule, similar to a podcast. Viewers can choose to receive notification on their mobile devices when scopes of people they follow “go live”. I was recently at a dinner event where someone chose to watch a scope at the table during the host's announcements, even commenting to those of us at the table about what was happening on the scope. It was very rude to both the presenter and the other attendees, as well as distracting. There are several safety things to consider when hosting a scope that I will cover in another post, but beyond safety here are the dos and don'ts that you, as a host, should abide by when scoping. I recently heard someone say “If you are planning what to say on Periscope, you are putting too much thought into it.” I could not disagree more. You should never do anything without first thinking about why and what results you are after, especially if it is for your business. An off-the-cuff, killing time, I don't care what we talk about attitude is not professional and will hurt your business' reputation. You should also plan your location, your background, your clothing, make-up, lighting and camera height. No one wants to spend 30 minutes looking into your mouth or up your nose. Adjust the camera height, take a step back and have an interesting background. Even if you are scoping for you, a personal not-work-related scope, you still represent your business, and/or brand. Act and speak and scope accordingly. As people learn the art of titling their scopes, it may be tempting to promise more than you can give, just to get people to join your scope and increase your audience or followers. Be sure that you can deliver whatever your title says your scope is about. And when you've finished, either end the scope or announce that you'll hang around to chat with those who have questions. Realize that if you are in a public place or business location you probably will not be able to control the background, interruptions, etc. Holding the camera close to your face may avoid background disturbances, but there may also be noises, music, etc that will be recorded in your scope. I watched one scope where someone chose to scope while in an public waiting area of a business and then complained about the announcements over the PA system interrupting their scope. It was neither polite nor professional. Be gracious. They have a business to run, and you are the one who chose to scope there. If your scope is of the question and answer type, or if you field questions from viewers, remember that those who watch the replay or recording may or may not be able to see the typed comments. The conversation is enhanced and easier to follow if you read or repeat the question prior to answering. There is no excuse for crass or inappropriate language. You are a professional. Act that way. I have seen numerous scopes where the host reverted to their informal conversational style and exclamations. And while perhaps they felt they were showing their true colors and “being real”, it was a huge turn off to those of us who had previously seen the host as a business professional. On a pre-announced, on-purpose scope, if you are spending the first 10 minutes live greeting people and “waiting for more to join us”, you are not serving your audience well. You are showing a disregard for the people who did join on time, making them feel they are not as important or just a number. Excessive greetings can also come across as egotistical and give the impression that this is really “all about you” and not about serving them. You need someone's permission if they or their conversation will be in your scope. Walking up to someone, entering a conversation unannounced, or scoping strangers without warning the participants that they are being broadcast live and without getting their consent could result in them taking legal action against you. Likewise, get permission from presenters, superiors, and participants if you want to broadcast on Periscope during a meeting or event. The legal ramifications of incorrect permissions for Periscope are potentially huge. The old adage works here too: “If you can't say something nice, don't say it at all.” Because of the live, world-wide nature of Periscope broadcasts, anything you say is immediately spread around the world for anyone who wants to see/hear it during the next 24 hours (unless you immediately stop your broadcast and delete it, but there could still be considerable damage done in seconds.) Do not say or imply negative things about other people, brands, businesses, etc while scoping. Even off-handed comments could be interpreted as slander, discrimination or libel and could result in a legal battle. There is not currently a way to communicate with people on Periscope outside of their scopes. You cannot message them directly through the app. Be sure you are giving your audience a way to connect with you and follow up. Mention your other social media platforms, where to find you on the web, your latest special or product sale and how to get it etc, to keep the interaction going once the scope is over. So, what is your opinion, as either a Periscope viewer or host? 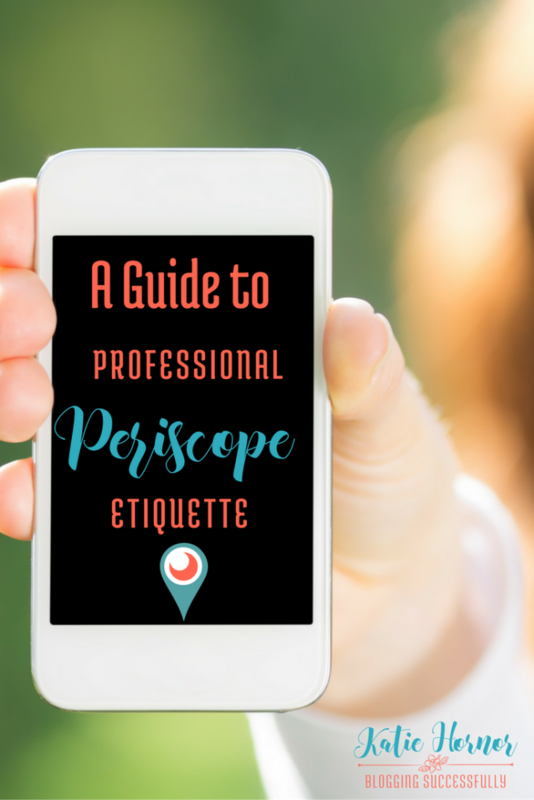 What would you add to this list of Professional Periscope Etiquette? Want to get more information like this on a regular basis? Join The Blog Connection! Great advice, I agree with everything said! Very thorough!